Don’t look now, but the Raiders of North Farmington remain undefeated at 9-0 in the middle of January after dismantling top ten ranked and OAA member foe Oak Park. The saying goes, “defense wins championship” has not come into fruition just yet for the Raiders, but Thursday night’s win laid the blue print on how to accomplish that feat. 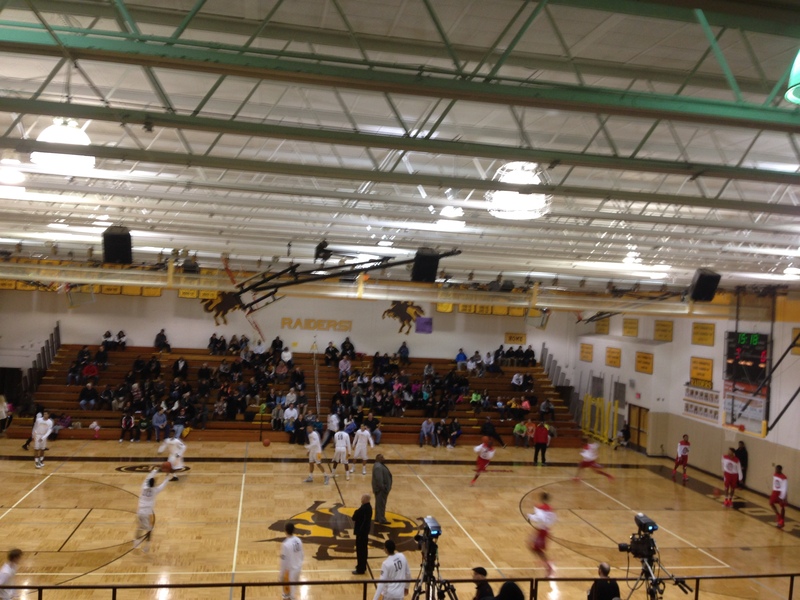 North Farmington’s pressing full court defense was able to force Oak Park into 27 total team turnovers on the night. A stat regardless of the amount of talent a team has is difficult to overcome. “Our coach always tells us to fly around and make people go at our speed,” said senior forward Anthony Qasawa. North Farmington came away with 14 takeaways in the first half, and built a 31-24 intermission advantage. The Raiders began to distance themselves early in the third quarter, starting the second half on a 10-2 run in which Qasawa netted seven of his 12 points in the quarter before finishing with a game high 25 points. North Farmington even streched their lead to as much as 25 in the third, with 6 different players scoring in the stanza. The Knights only found continuity within their offense late in the fourth, as many starters for North Farmington found themselves seated on the bench, the lead never dwindled below 16. Giving the Raiders a well deserved victory. “This was a huge statement win for us because it proves we can hang and beat the top teams in the state,” Qasawa also said. The lone bright spot for Oak Park was senior guard Howard McInnis, with a team high 18 points, followed by Kelvon Fuller with 10 points, five rebounds, and four blocks. Aside from his 25 points, Qasawa also came away with five rebounds, and three steals and assists. Fellow senior Jeron Rogers netted 15 points and seven rebounds, while the junior class provided support as well. Alex Darden contributed 11 points, and five rebounds, point guard Jacob Joubert had nine points five steals and three assists, and Josh Hogans stepped in off the bench for eight total points. The win for North Farmington comes despite key transfer in junior Billy Thomas sidelined. Thomas has been in the state for roughly two weeks, he was in attendance for the game, but did not dress. Thomas could possibly return as early as next Tuesday when all transfers across the state gain eligibility. Regardless, when the time comes, Thomas will add another dimension to frustrate the Raider opposition.